It does mention broadband and health spending. THE DUP’S DEAL to prop up Theresa May’s Conservative Party focuses on three policies: pensions, armed forces and farming. The document, agreed today between Arlene Foster’s party and the embattled Tory Prime Minister, contains no mention of the Irish border or language. Nor does it make any mention of Northern Ireland’s status during Brexit. 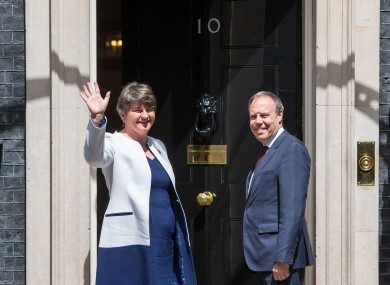 The document also commits to early restoration of the power-sharing executive in the North, but agrees that the DUP will have no role in the British government’s involvement in those talks. A further document published this afternoon outlines the spending that will be committed to Northern Ireland. Foster, flanked by party cohorts Nigel Dodds and Jeffrey Donaldson, said that the agreement, which will see in the region of £1.5 billion (£1 billion in new money, and £500 million in future spending commitments) gifted to Northern Ireland for investment in infrastructure, will deliver “a stable government in order to further the UK national interest at this vital time”. This agreement will remain in place for the length of this parliament, Foster said. Email “No mention of the Irish border in DUP's Tory deal”. Feedback on “No mention of the Irish border in DUP's Tory deal”.